Everybody is accustomed to the fact that digital telephony in home segment could be represented by either SIP-adapter or by means of hardware telephone featured by similar protocol. Today, in our lab, we will examine ASUS AX-112W wireless router which provides voice functions in addition to general network features. Voice transfer via IP-networks is now commonly used. But in order to have an opportunity for voice communication a user had either to install special software to his PC (e.g. Skype), or to purchase additional hardware, that is VoIP-device (SIP or H.323): telephone or adapter. If a user had several PCs or laptops at home, then purchasing a router became necessary. 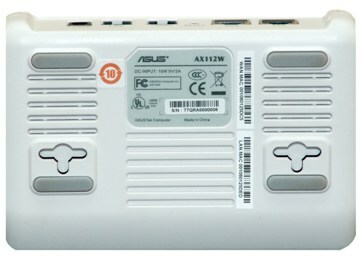 The use of such “combine” as ASUS AX-112W allows going without a number of devices and yet keeping advantages of modern voice technologies. All that you need is just to connect all the wires to one device, configure wireless segment and enjoy the benefits of civilization. Let us study this device in detail. 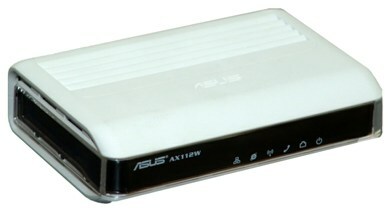 ASUS AX-112W wireless router with voice functions has a white plastic case which is traditional for SOHO class products. Mirror-like front and side panels are the exceptions. It should be also mentioned that this model is supplied with a portable case for the device carrying. Rubber mounts on the bottom as well as T-shaped manufacturing holes make it possible to install the device not only on the table but also on the wall. 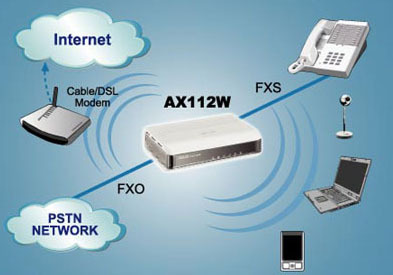 The rear panel of AX-112W contains two FE-ports (RJ-45) for home and service provider network connections, two analog telephone ports (RJ-11) for telephone connection and access to PSTN, power connector and Reset button. 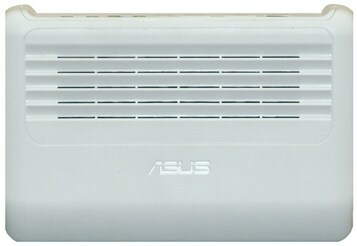 In spite of the fact that ASUS AX-112W is a wireless router, there is neither changeable nor unchangeable external antenna – the whole wireless section is put inside the case. The inner part of the device is much more interesting. Microelectronic structure is composed of three green textolite cards, arranged in parallel. 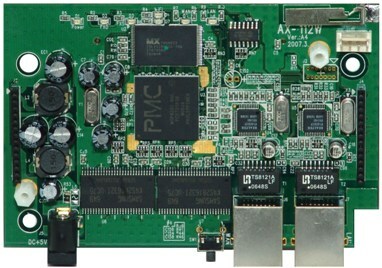 The most simple one is, probably, a wireless module, which could be characterized as a Lite-On product with Atheros microchip AR5005G and supporting 802.11b & 802.11g standards. 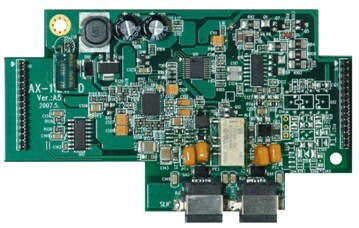 AR5005G card operational chart is provided under miniPCI module figure. The lower card was not featured by any interesting elements. According to our opinion, it is used as analogue isolation for telephony. 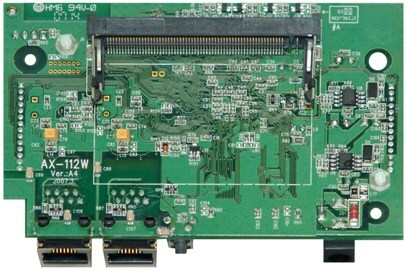 The middle card, even not being single-sided, contains at the top only wireless module connector and several insignificant elements. The reverse side contains multifunctional processing unit MSP4200-NGC, produced by PMC-Sierra. Processing unit clock speed is 170 MHz. 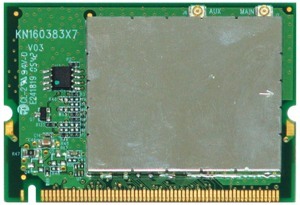 Asus AX-112W is featured by 32 MB RAM (two microchips K4S281632I-UC75 16 MB each) produced by Samsung. The microchip 29LV320 by Macronix is used as a flash-memory here. The flash-memory capacity is 4MB. 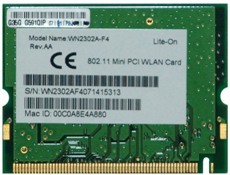 This kind of RAM and flash-memory microchips were already noticed in Asus products, e.g., in the portable access point Asus WL-330gE. The wired physical layer is controlled by two modules Realtek RTL8201CP, providing connection at speed 10/100 Mbps. Review of definitely interesting Asus AX-112W hardware is completed hereby, and we pass on to its software. To get an access to AX-112W web-interface you should put an address 192.168.1.1 in the address bar of any browser and then type-in the login and password, equal to admin/admin by default. Upon successful authentication, the user finds himself in the router main page, where the system, network and date/time information are presented. Let’s make a brief review of the most interesting features of the device, which can be controlled via the web-interface. In the Settings subitem of the WAN menu there are parameters of AX-112W external interface. 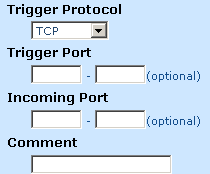 Only three modes of WAN-port are supported at the moment: dynamic (DHCP Client), static (Static IP) and PPPoE. There is no support of PPTP tunneling protocol popular in Russia. It can make the use of this voice device in some providers’ network impossible. We find the settings of AX-112W wireless part interesting as they allow the router to be both the access point and the wireless client. 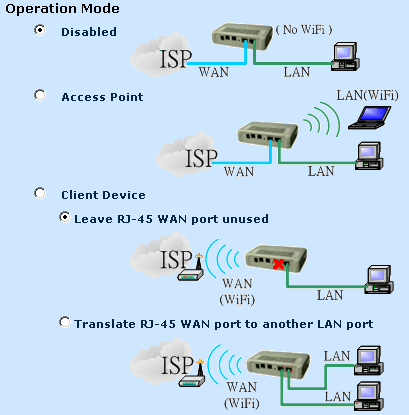 In the last case, there exists the possibility to combine WAN and LAN ports into one segment of local network. At present, only few models introduced by manufacturers are featured by such options. The wireless network client support will enable connection of the existing wired network to any available access point thus providing internet connection for wired PCs and SIP service as well. 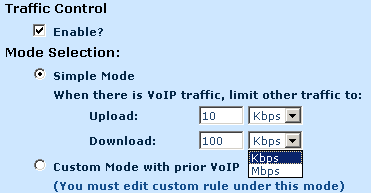 The VoIP item has five sub-items: System Settings, SIP Server, Service Code, Codec and Misc. 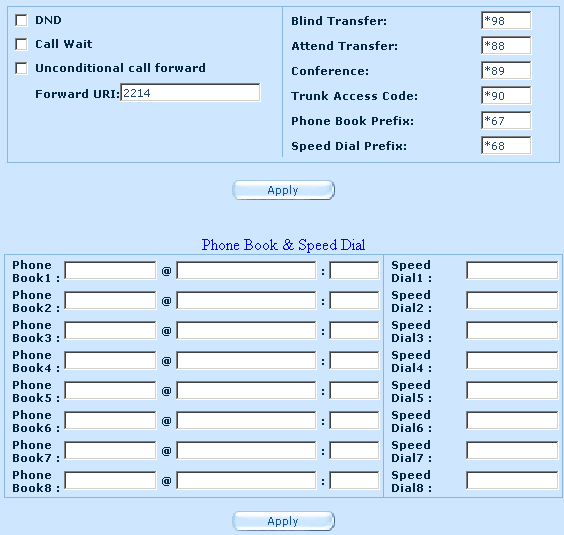 In these sub-items administrator can configure almost any type of parameter that is connected somehow with dialing operation, codecs, phone book and speed dialing list. 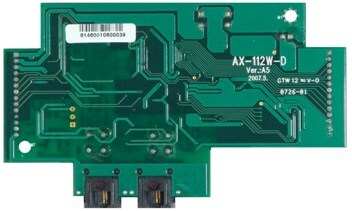 It should be noticed that this model like AX-112 has IVR – Interactive Voice Response, which allows performing preliminary configuration of AX-112W without PC. 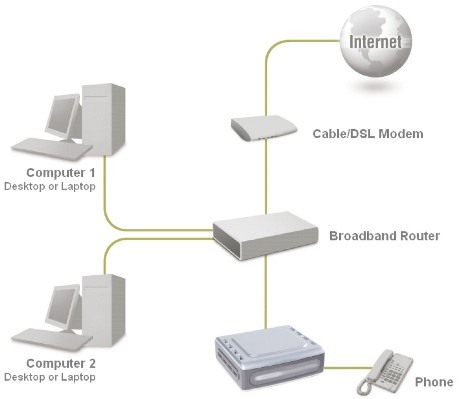 It means that for SIP-gateway connection and start functioning only an analog telephone and connection to ISP are necessary, and it appears to be very convenient in cases, when PC is not even available, and the internet-channel is used only for telephony. Let’s turn to the Firewall item. It is quite uncommon. The item has two sub-items: Settings and LAN to WAN. 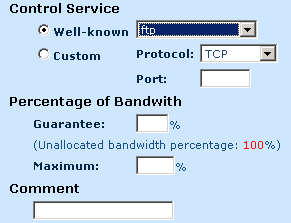 The Settings sub-item is responsible for settings traditional for firewall: detectable attacks as well as transport and network protocols abnormalities, port scan attempts. The LAN to WAN sub-item, according to its name, allows an administrator to establish rules of permission and denial for output connections. There are no rules for input connections setting – they are just denied because of fixed network address translation (NAT). As it was mentioned above an administrator can’t refuse NAT, i.e.it is impossible to deselect IP Share (masquerade) flag at NAT-Settings page. NAT is necessary when a provider gives only one IP-address to the client which is used to provide an access of all user’s network devices and PCs to global network resources. If the network is more complicated the client may be given a range of IP-addresses. This makes NAT unreasonable. The rest is as usual: DMZ, ALG, Port Redirect and Port Trigger. The Traffic Control item seems to be logical for devices generating traffic sensitive to delays. 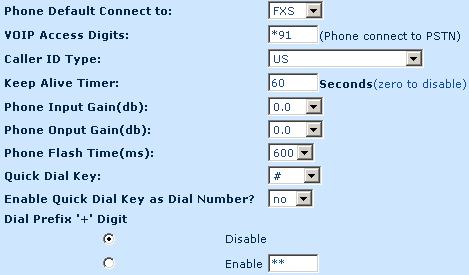 This point indicates channel on a percentage base or in bits available for nonvoice message. Setting of QoS in networks with voice traffic is necessary for providing a more qualitative telephone traffic transmission since at leaking of mechanisms supporting the priority of voice data trembling and delays in line will increase. This will cause the sense of discomfort or make the conversation impossible. There are two sub-items in this item: Policy Mode and Custom Rule. The first of them just limits bandwidth available for other applications or switches to manual mode. 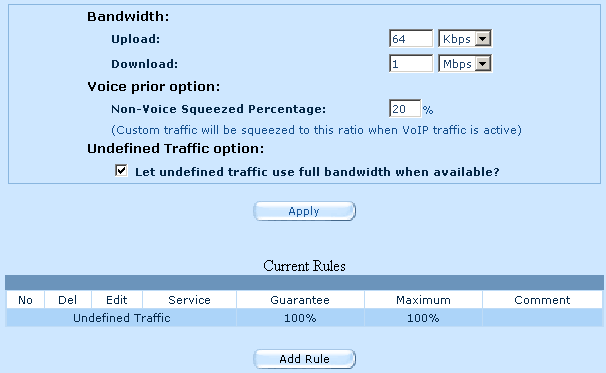 The second sub-item (Custom Rule) allows making precise correlation of bandwidth and traffic types. The firmware upgrade may be carried out in the sub-item with the same name (Firmware Upgrade) via one of two protocols HTTP and TFTP. 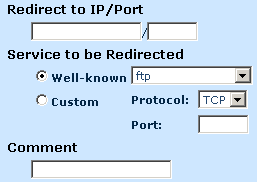 The possibility of upgrade via TFTP is non-typical for web-interfaces of SOHO devices. Hereby review of web-interface is over. 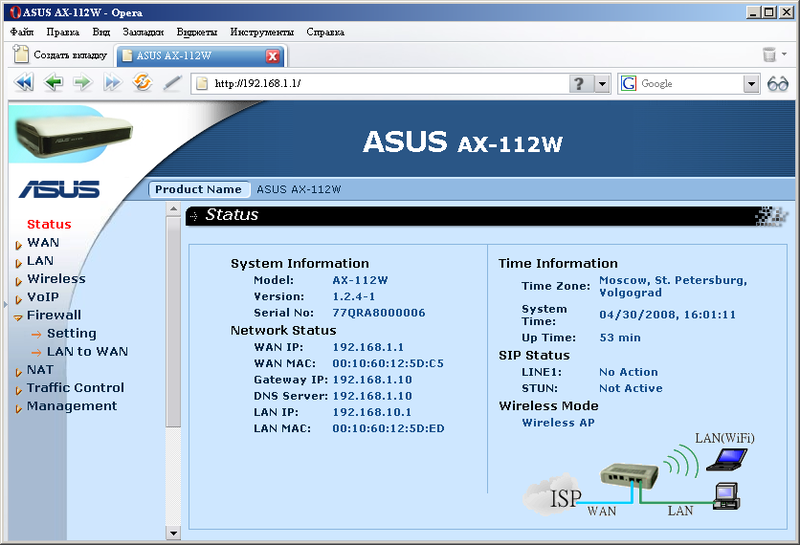 It was decided to begin testing of ASUS AX-112W with determining the router boot time. Under the boot time we understand the time interval between the moment of power connection and return of the first ICMP echo-response. The voice gateway under the test boots in 35 seconds. This is normal for such kind of devices. PC parameters used for testing are as follows. Then router protection checking from the WAN-port was carried out. The checking was carried out by means of Positive Technologies XSpider 7.5 Demo (Build 2000) network security analyzer. We found only one open TCP-port 80 where web-server for controlling AX-112W is located. Detected vulnerabilities for TCP-80 port are shown below. It should be mentioned that during testing standard password was set. This caused one of scanner’s responses. In the real net an administrator will use a more complicated password. This will eliminate this kind of vulnerabilities. In our opinion, the detected vulnerabilities are not critical. No abnormalities during testing of SIP gateway protection by means of XSpider utility were detected. But ICMP echo-responses were not steady. It should be emphasized that this fluctuation of response time doesn’t influence operation of ASUS AX-112W. Voice gateway operates correctly without distortion of transferred speech. There is one more traditional testing for routers, i.e. detection of device maximum speed at which it performs commutation and routing. We also performed this test. We chose netcps and Jperf as traffic generating utilities. ASUS AX-112W routs data from LAN to WAN at the speed 30 Mbps. The speed 34 Mbps was achieved at packets data transfer from WAN to LAN and the total speed 40 Mbps was achieved at simultaneous traffic transfer in both directions. If we compare the obtained speeds with the ones on previous model of voice gateways ASUS AX-112, we’ll see great progress concerning the capacity of commutation/routing part of device because transfer speed of nonvoice data increased twice. Evidently “AX-112W+” will be produced. It will let transfer data at wire speed. Also we decided to check the influence of data transfer via AX-112W on the quality of voice in the phone connected to the testing device. The test showed that independently from traffic control settings and traffic itself (testing was performed for TCP-flow) the speech is transferred via router without gaps and disturbances. In any case, we do not recommend using ASUS AX-112W as a router if you possess high-speed Fast Ethernet channel, because its installation will cause decreasing of speed to 40 Mbps. It should be mentioned that during testing we connected the router to Cisco switches. Speed and duplex at these switches ports were set manually. Probably it resulted in incorrect determination of these parameters by AX-112W and caused serious decreasing of transfer speed. Low speed of commutation and routing. There are no new firmwares. There is no User manual in Russian and English at web-site and in hard form (only AX-112W setting manual is attached for work with www.carpo.com/www.carpo.de). Masquerading is impossible to be switched off. Errors occur in some cases at detection of speed and duplex of the line. Support of tagged virtual network at WAN-port (802.11q). Steady operation as a voice gateway. 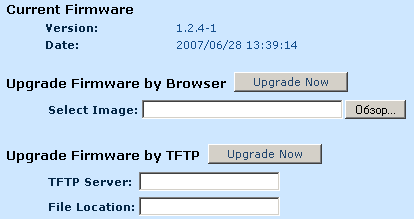 Possibility of firmware upgrading not only via HTTP, but via TFTP as well. Comfortable soft bag for device carrying. Availability of additional plugs for external power supply. 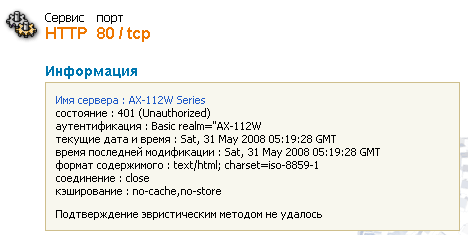 By the moment the article was written the price of ASUS AX-112W in Moscow online-shops was $100.